Founded in 2003, the Jameson Dublin International Film Festival continues to lead the way in the presentation of outstanding Irish and International film. Over the past thirteen years the Festival has hosted over 500 major guests along the way ranging from Irish mega stars Colin Farrell, Brendan Gleeson, Cillian Murphy, Daniel Day Lewis, U2 to Hollywood A-listers Al Pacino, Mark Wahlberg, Glenn Close, Joss Whedon, Danny DeVito and Richard Dreyfuss. The Festival has screened world cinema from 52 different countries, a total of almost 1,500 films, of which 300 were Irish features including world premieres of Once, Ondine, In Bruges, Calvary, The Stag, and The Secret of Kells. In addition there has been a vibrant, ongoing programming of International out of Festival events with huge talents Ben Affleck, Quentin Tarantino, Bryan Cranston and Ennio Morricone. Academy award winning actor Russell Crowe will attend the festival next month to introduce his stunning new film The Water Diviner and participate in a post-screening Q&A at the Savoy Cinema. Entertainment One’s forthcoming release, The Water Diviner, is an extraordinary tale of love, faith and heroism. Four years after the devastating battle of Gallipoli in Turkey during World War I, Australian farmer and water diviner Joshua Connor (Russell Crowe) travels to Istanbul to discover the fate of his three sons who enlisted to fight amongst their allies but have been reported as missing in action. When his questions are blocked by military bureaucracy, he’s aided by a beautiful hotel owner (Olga Kurylenko) and then by Major Hassan, a Turkish war hero (Yilmaz Erdogan) who becomes an unlikely ally. As Joshua heads across the tragic, war-torn landscape searching for answers, he struggles to find his own peace but desperately holds onto hope. “I first encountered Russell Crowe in Romper Stomper in 1992, a blistering breakthrough performance of incredible power and startling intensity – two elements which he has brought to over two decades of indelible screen roles including LA Confidential, The Insider, Gladiator , A Beautiful Mind et al. The Water Diviner is an impressive, beautifully shot epic war drama. Russell Crowe has created a powerful portrait of loss and redemption with fine performances, not least his own as lead. It’s a pleasure to welcome Russell to Dublin for the festival screening of The Water Diviner and present the film to his many Irish fans”. The 13th Jameson Dublin International Film Festival takes place from 19th – 29th March 2015. The full lineup for the Festival programme will be announced on Wednesday February 25th www.jdiff.com. 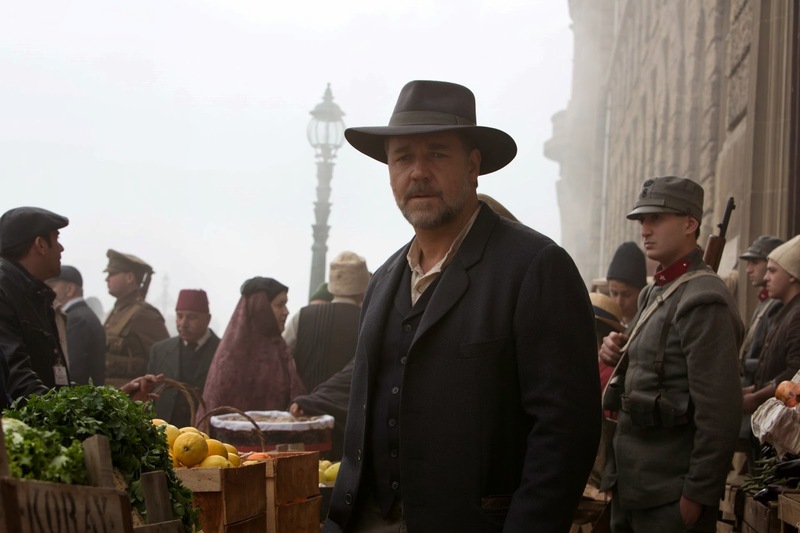 The Water Diviner will be released in cinemas by Entertainment One on 3rd April 2015. The Water Diviner: The Savoy Cinema | Friday 20 March. Tickets will be officially on sale for this event as of today and can be purchased online http://bit.ly/1McTsGv or www.jdiff.com or at their Box Office which is now open Monday to Friday 11am - 5pm on 13 Lower Ormond Quay. The JDIFF 2015 Season Ticket is currently available to purchase at €245 along limited edition merchandise. Also new this year is the Bring A Friend Season Pass, two season tickets for €425.